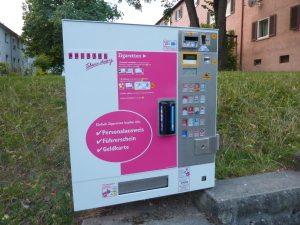 Depending on the type of national regulation, cigarette vending machines pose serious problems for tobacco control including: increasing cigarette availability, facilitating smoking relapse, providing cigarette access points for children and other non-smokers, normalizing cigarette purchases , and serving as a promotional tool for the tobacco industry. There is a wide range of variations concerning how different nations regulate cigarette vending machines. Some countries like England, Greece, Croatia and Singapore have outright bans, while many others restrict machines to over 18 venues and/or mandate staff to verify age, sometimes issuing special tokens or requiring staff to operate machines. 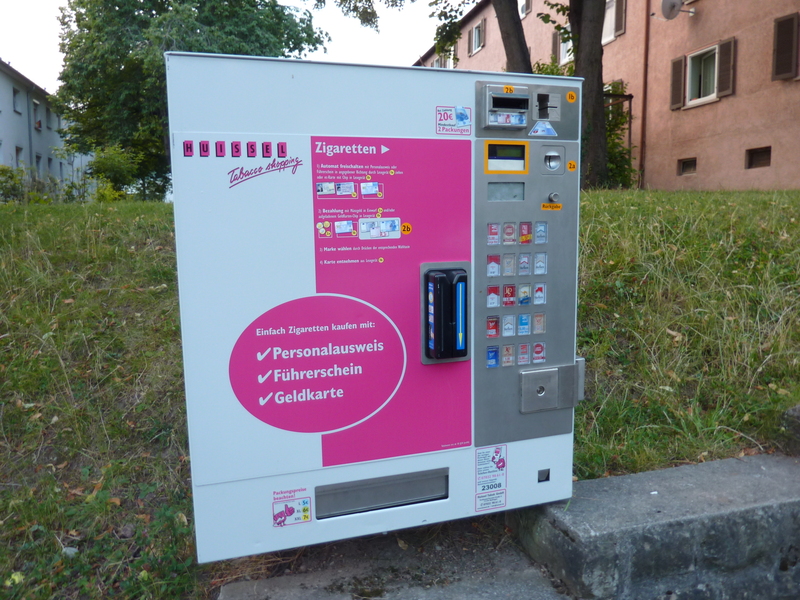 In July, 2014, while holidaying in Stuttgart, I was shocked to see how ubiquitous cigarette machines were in public places. 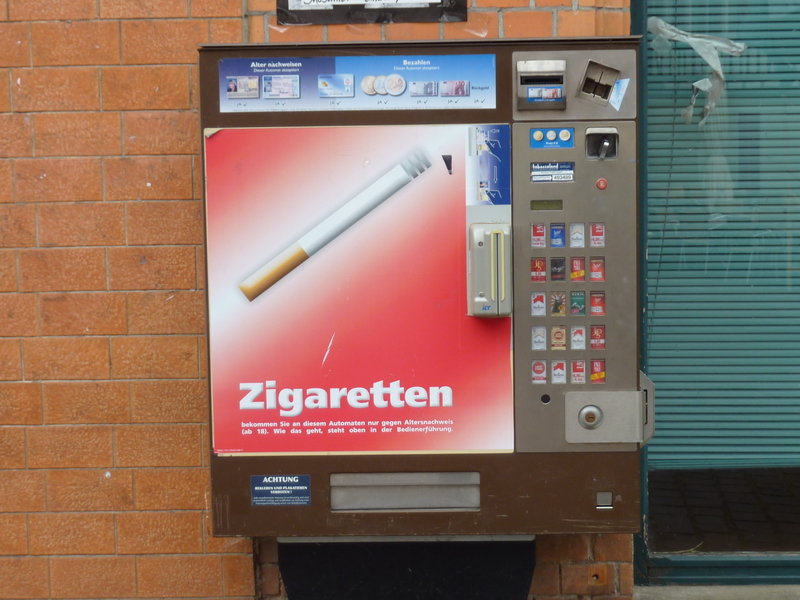 Amongst developed countries, Germany must rank as one of the nations with the most laissez-faire approach to cigarette vending machine control. In a suburban street outside my Stuttgart hotel, one vending machine was located right next to a small park where children of all ages were observed playing ball games. This site was also only approximately 20 metres from a busy pre-school. What a marvelous way for the tobacco industry to show the pre-schoolers on a daily basis just how socially acceptable smoking is. To operate vending machines, a German identity card or driver’s licence is required to ‘prove’ the purchaser was over 18. How easy would it be, however, for a child to borrow, with or without permission, an adult’s age verification, or for parents to send their child to buy cigarettes for them? Interestingly, the machine near the hotel required a minimum purchase of two cigarette packs: excellent for cementing relapses or for fostering dependence in experimental smokers. Vending machine affixed to low wall on footpath next to small park frequented by children of all ages. Another machine was photographed on the external wall of a shop in a village square about 30 minutes from Stuttgart, opposite the small town hall. Although there were some small advertisements for other goods on the few shops in the square, the cigarette picture on the vending machine was both the most eye-catching and the largest promotional item in the area. 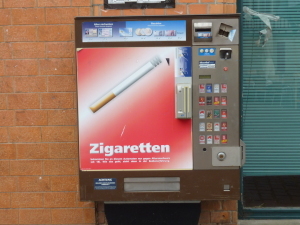 Vending machine with large cigarette ‘ advertisement’ mounted on the external wall of a shop facing the village square and town hall. It seems extraordinary that the placement of vending machines in public streets probably makes cigarettes the most accessible retail product in Germany. Germans certainly have a long way to go when it comes to eliminating the harmful influence of cigarette vending machines on public health.